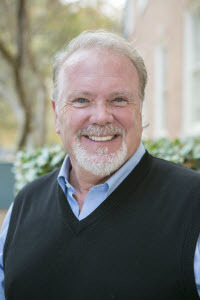 Dr. David M. Finn is a Professor of Special Education and also serves as the School of Education International Director. Prior to coming to Samford, he directed several programs for infants, toddlers and school-age children who had significant disabilities. His programs serving adults with disabilities included On-the-Job Training (OJT) and managed sub-minimum wage contracts for client employment opportunities. After completing his doctorate, he held teaching and clinical positions at the University of Washington in Seattle, the University of Hawai’i at Mano’a (Honolulu) and UAB. Dr. Finn helped to start the first teacher certification program in special education and, at the same time, developed the Children’s Learning Center; a fully inclusive child development center. David is a frequent keynote speaker at state, national and international conferences most recently in Beirut, Lebanon, Dubai and Taiwan. His research interests include serving refugee children in the Middle East who have special needs, Autism Spectrum Disorders, Educational Neuroscience, and school safety. His publications include a variety of tests for families of young children with special needs. Wolmesjö, M., & Finn, D.M. (2014, Fall). “Spousal abuse in Sweden.” National Council on Family Relations Report Magazine. Minneapolis, MN. Finn, D.M. (2014). “Parenting children with special needs…(Content expert)” In Bigner, J. & Gerhardt, C. Parent-Child Relations: An Introduction to Parenting. (9th ed). Upper Saddle River, NJ: Pearson/Merrill. Finn, D.M. (2014). “Family formation and parenting…(Content expert)” In Bigner, J. & Gerhardt, C. Parent-Child Relations: An Introduction to Parenting. (9th ed). Upper Saddle River, NJ: Pearson/Merrill. Finn, D.M., Woolley, T., Gao, M., Giles, L., Jing, Q., Li, H., Lu, L., Talton, J., Williams, L., Yan, Y. & Duncan, R. (2013, March). “Samford School Safety Survey.” Unpublished Manuscript, Samford University: Birmingham. Finn, D.M., Woolley, T., Gao, M., Giles, L., Jing, Q., Li, H., Lu, L., Talton, J., Williams, L., Yan, Y. & Duncan, R. (2013, March). “Samford School Safety Survey. Finn, D.M. & Gilchrest, E., (2018, October 15). “Safety First: Screen Addiction ofYoung Children.” Alabama Early Intervention Infant and Preschool Conference, Birmingham, AL. Finn, D.M. (2017, October 24). “Navigating the Galaxy: The neuroscience of learning and infants,” Alabama Early Intervention and Preschool Conference, Huntsville, AL. Finn, D.M. (2017, May 23). “Strategies to enhance social emotional development in young children.” Central Alabama Early Intervention Conference Update. Tuscaloosa, AL. Finn, D.M. (2016, September 23). “Gifted students with Autism Spectrum Disorders and Asperger’s Syndrome,” Alabama Association for Gifted Conference, Birmingham, AL. Finn, D.M. (2015, April 17-24). National Day Celebration Conference. Beirut, Lebanon. Finn, D.M. (2015, November 25 & 26). “Neuroscience and Learning.” (an invited lecture for the European Union (on behalf of the United Nations Relief and Works Agency (UNRWA) for Palestine Refugees in the Near East, and targets Palestinian refugees in the medical and paramedical staff in those areas of Lebanon). Ain al-Hilweh (Sidon) & Shatila (Beirut) camps, Lebanon. Finn, D. M. (2015, November 28). “Neuroscience and Learning: Applications to Enhance Student Learning,” in Dubai, United Arab Emirates. These conferences were coordinated by LEAPS (Learning Emotionally Academically Physically and Socially), a nonprofit special education support agency in Beirut. Finn, D.M. & Eastman, D. (2016, April 18). Parent and Teacher Workshop, Azm School, Tripoli, Lebanon. Finn, D.M., Crane, T., Eastman, D. & Delaney, M. (2016, April 23). National [special education] Day for Students with Learning Difficulties Conference. Beirut, Lebanon. Finn, D.M., Montgomery, D., & Butterworth, B. (2016, November 11). “Learning Disabilities: Taking a closer look into Dyslexia, Dysgraphia & Dyscalculia.” American University Beirut and LEAPS Center (Learning Emotionally, Academically, Physically & Socially. Beirut, Lebanon. Finn, D. M. (2016, November 12). “Neuro-Architects: How today’s teachers can effectively enhance the developing brain.” American University Beirut and LEAPS Center. Beirut, Lebanon. Finn, D.M., Bishop, C., Bishop, D., & Taylor, P. (2017, March 15-25). “Student learning and collaborative faculty opportunities at Samford University.” Presented to multiple agencies, schools, universities and national leaders and universities in Lebanon, Egypt and Jordan. Finn, D.M. (2018, February 9). “Linking Neuroscience in the Classroom” (Conference Keynote). Innovation in Education Conference (American Community School and LEAPS), Beirut, Lebanon. Finn, D.M. (2018, February 9 & 10). “Neuroscience Applications for Today’s Teachers.” Innovation in Education Conference (American Community School and LEAPS), Beirut, Lebanon. Finn, D.M. & Haralson, M. (2014, January 20-24). Teaching Children with Special Needs Through Technology in the General Education Classroom. Lebanese Society for Educational and Social Development (LSESD)-Project SKILD (Smart Kids with Individual Learning Difficulties). Presented to 8 schools across Lebanon in cities including Beirut, Zahle, Chouf, Sidon, and Antellias. Finn, D.M. (2013, April 29). Autism Spectrum Disorders: An Overview of Characteristics and Learning Styles. Paedagogische Hochschule Weingarten University, Weingarten, Germany. Finn, D.M. & Gerhardt, C.E., Cohen, D., & Naramore, S. (2013, April 24). Children with Autism and Hyperacusis: Procedures for Reducing Stress and Anxiety in School Setting during Safety Drills. International Conference on the Implementation of New Teaching Methods in Special Education. Technical University of Liberec, Czech Republic. Finn, D.M. (2013, April 22). Autism Spectrum Disorders:An Overview. Lebanese American University, School of Arts and Sciences. Beirut, Lebanon. Finn, D.M. (2013, April 20).“Lessons from Neuroscience:Applications to enhance student achievement.”Second Annual Conference for Learning Disabilities for parents and educators.UNESCO Palace, Beirut, Lebanon.